"Are you a GMO free company and want to showcase it in our Brand Spotlight section?" Add Your Company! Check GMO has created something great for restaurants. Restaurants can opt-in to our Check GMO program to give customers information about GMO contents in their restaurant’s menu. By adding your GMO free and/or GMO foods to our database, your customers will be able to find your restaurant menu with our iPhone and Android Apps. Let your customers know that you care about their health by choosing to opt-in to the Check GMO Program for your restaurant. Contact info@checkgmo.com today for more info. INGREDIENTS: 1/3 cup Organic strawberry preserves 1/2 cup Organic medium prepared salsa Non GMO Tortilla chips DIRECTIONS: Combine preserves and salsa in small bowl Cover and chill at least 1 hour before serving. Enjoy! 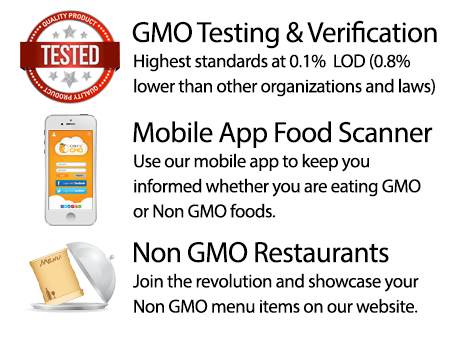 Check GMO LLC is a Phoenix based corporation created to provide customers with knowledge about the foods they put in their bodies, with easy to use tools such as the mobile App Barcode UPC scanner. Check GMO’s mobile App provides users with a simple scanning. With just the press of the button, users can find whether or not food has Genetically Modified Organisms (GMO) in it. Results will show GMO Free, GMO and or unverified. Check GMO is also very proud to provide the Check GMO Restaurant Program that allows Restaurants to submit their information about the foods they provide to their customers with Owner & Chef comments as well. Check GMO LLC strongly believes in a health conscience world and wants to assist with revealing the mysteries and answers that we come to find out about the food we eat.